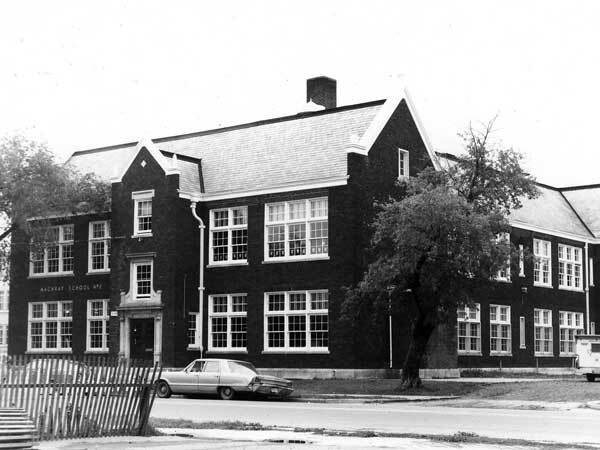 The present Machray School is the fourth structure to bear this name on this site, at the intersection of Charles Street and Mountain Avenue. 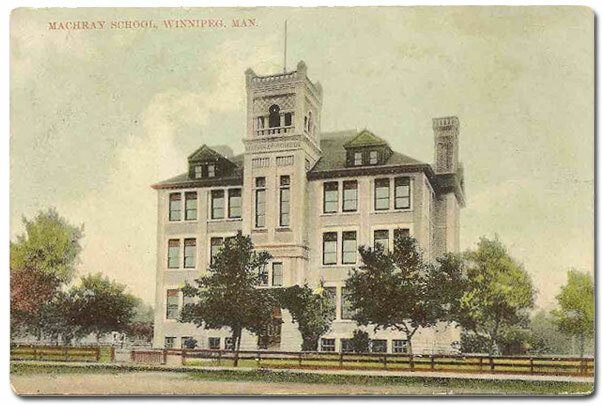 The original one-room school, named for cleric Robert Machray, was designed by Winnipeg architect James Chisholm and constructed in 1886. 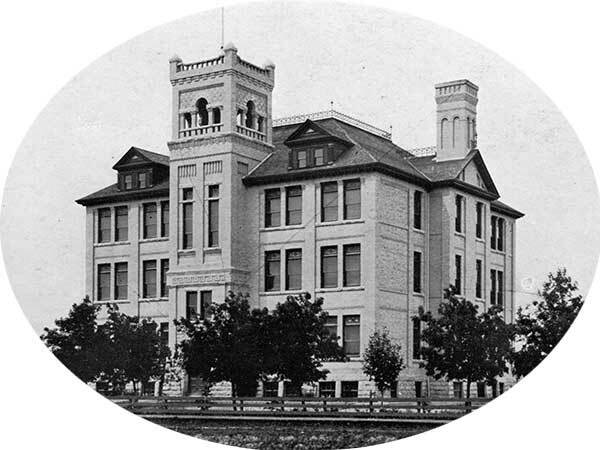 Enlarged with two more classrooms in 1891, the school was replaced in 1899 with a ten-classroom design by H. S. Griffith, with classes beginning in the new building in 1900. 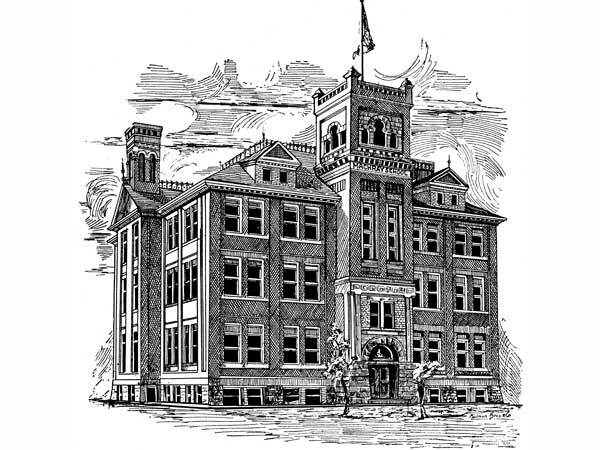 A 14-room addition was made to it in 1913. This second building was replaced in 1921 by one designed by local architect J. B. Mitchell. 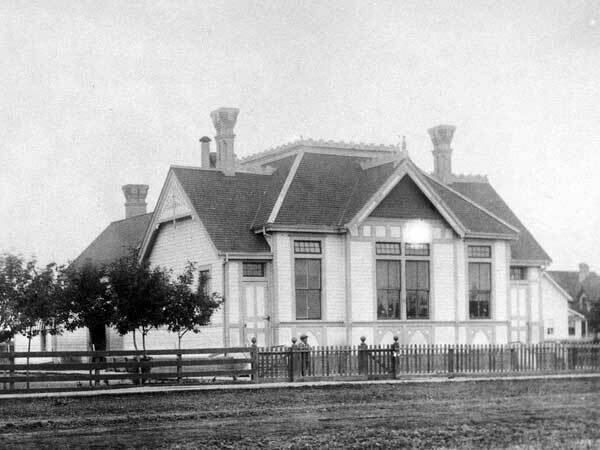 It was later demolished and replaced by the present building. Elementary Department: Mrs. B. Armstrong, Miss C. Campbell, Miss B. Carnahan, Miss R. Dashefsky, Miss W. Flatt, Mrs. E. Goszer, Mrs. J. Horne, Miss E. Hunter, L. Karlowsky, Miss A. Kowalson, Miss B. Levesque, Miss M. Meder, Miss A. Parker, J. Smith, Mrs. A. Smythe, Mrs. E. Steer, F. Tindall. Intermediate Department: Miss F. M. Dolron, Miss E. Elias, Mrs. B. Finch, Miss J. Foster, J. Frater, G. M. Goodman, Miss M. Hyman, Mrs. A. Kedziora, W. Korchik, Miss J. Kortash, B. Margolis, Cecil D. Muldrew, G. Olfert, Miss D. ? “Parting presentation,” Manitoba Free Press, 2 March 1891, page 6. “Winnipeg schools, No. 8—Machray,” Manitoba Free Press, 24 October 1922, page 11. “Machray old-timers’ reunion is planned for May 27 and 28,” Winnipeg Free Press, 15 May 1943, page 11. “Machray classrooms multiply while district booms” by Claire Tisdale, Winnipeg Free Press, 31 January 1949, page 4. “Principals shuffled,” Winnipeg Free Press Weekly North Edition, 2 July 1989, page 2. We thank the Winnipeg School Division and Cheryl Girard for providing additional information used here.